When I was small, I had an imaginary friend, a teddy bear who marched behind me to school. Teddy lent promise and comfort, he had my back. Around the fourth grade, Teddy fell back to simply being a bear, a beloved bear who still lives in my house. Now, I like to concoct imaginary outfits, and daydream that I might wear them. I don't feel covetous, just appreciative. 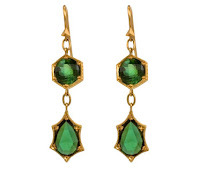 My fantasy outfits always start with the jewelery, like this exquisite pair of Cathy Waterman green tourmaline earrings. The drops, nearly 2 inches long, are set with rose cut and pear stones (13.51ct tw) in 22K g old, $4,750. Which I will wear with the Alexander McQueen Chevron dress, $1670 from Bergdorf Goodman. so I'll choose these Prada peep-toe pumps, $650 from Neiman Marcus. The mix of gray and chocolate is so Italian. So sophisticated, and really, this imaginary outfit would be cheap at twice the price! Oh I do this too! Everything fits in fantasy land and its all affordable but more importantly Duchesse, I need to borrow your fantasy outfit for a fantasy dinner date I have, is that ok? Cybill: Should things, um, progress on your date, the lingerie under this is of course La Perla. Karen: I just use the photo import tool on blogspot and move it around till it looks OK. I'm having trouble with Polyvore, it doesn't seem to be Mac friendly- or I need more help than the tutorial is giving. Ooh, those earrings are TDF. That's a lovely ensemble, the stuff of dreams. Duchesse, the Polyvore thing can be absolutely maddening. If it weren't for my 11 year old kid, I would be lost....Keep trying, and read their blog for help. Or ask me.